Fewer people used Laguna Beach’s public transit this summer, yet 90 percent of downtown parking remained occupied over the summer months, according to a city report. Parking revenue rose 12 percent in 2017, totaling $3 million, reflecting a jump in meter rates to $3.75 an hour from $3. City officials aimed to reduce downtown parking congestion by hiking the hourly fee, according to a presentation at Tuesday’s City Council meeting. The higher charge didn’t seem to deter drivers. The report showed downtown parking occupancy was 90 percent on Broadway Street, and Ocean and Forest Avenues during both weekday evenings and weekend days. That usage paralleled parking occupancy rates in 2016. By contrast, fees do appear to deter motorists from taking advantage of city-contracted periphery parking lots, including one at Mission Hospital in South Laguna. Usage declined to 30 percent this year and 23 percent in 2016 when a $5 parking fee was imposed, compared to 94 percent weekend usage in 2014 when parking at Mission Hospital was free, the report says. The city pays Mission Hospital $68,000 a year to use the 300-space lot, but only makes $16,000 off of annual parking revenue. City staff pointed to the charge, added parking at Salt Creek Beach and the additional Ritz Carlton trolley stop as reasons for the steady decrease. Similarly, in the canyon, public use of the 150-space Laguna College of Art and Design lot fell to 25 percent occupancy this year on weekends, compared with 78 percent last year. Conversely, peripheral parking in the 264-space ACT V lot has steadily increased year-over-year since 2014 to 90 percent this year, and the 72-space lot at the Susi Q Community Center jumped in usage, with 92 percent weekend occupancy. Mayor Toni Iseman expressed her frustration over attempting to lure motorists to leave their vehicles in Laguna Canyon lots. “If we want to stop them, we have always had good intentions, but we need to turn up the heat to make people know that is the place to park and I don’t know how we do it,” she said. Overall public transit boardings decreased 7 percent this year, with 569,073 total boardings or an average of 8,755 boardings per day on all transit services. That figure includes all public transit routes: neighborhood trolley routes, the city’s long and short coastal trolley routes on weekends and in summer, and the Summer Breeze bus route, which transports visitors from a parking lot near the I-405 interchange during the peak summer season. Deputy Director of Public Works Paula Faust attributes the overall decrease in ridership to an earlier start for schools in nearby districts, the Festival of Arts ending a week earlier than the town’s other art festivals, and three fewer service days in 2017. Standing alone, the Summer Breeze bus service did show an increase in ridership of 51 percent over 2016. “The Summer Breeze did have success this year and a lot of that has to do with our robust marketing program,” Faust said. Neighborhood transit boardings alone decreased 19 percent over 2016, to 36,000 total boardings, or an average of 562 per day. 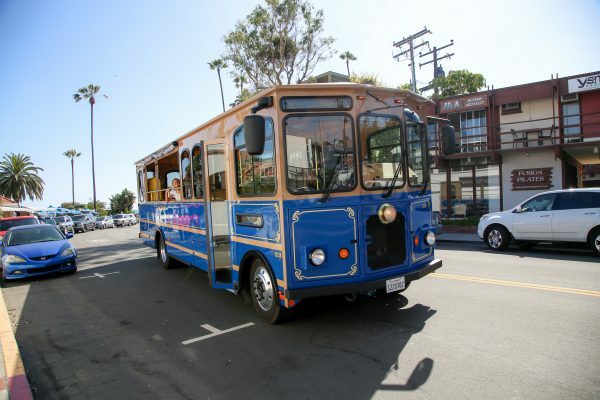 Faust told council members that drop could be related to the city’s Trolley Tracker App, which she says was unreliable for much of the summer until updates were made in August. “We found that does affect ridership,” Faust said. Resident Hillary Cole told the council she was alarmed by the decrease in use of public transit, and blamed it on poor communication to the public. “I think that if ridership is down we have a significant issue with letting people know there is transportation around Laguna,” Cole said. 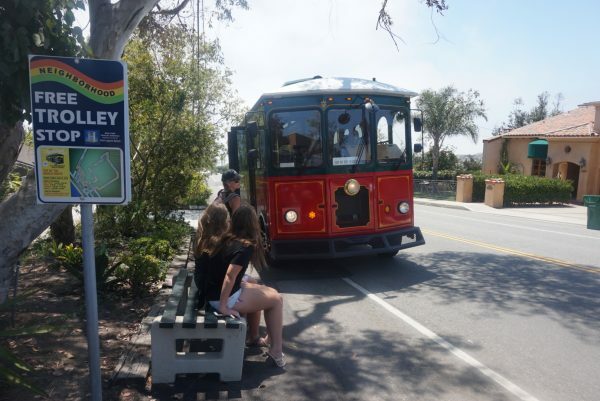 Two new coastal routes were introduced this summer, a short route making all stops from North Laguna to Seventh Avenue and the limited coastal route, making fewer stops from the transit depot to the Ritz Carlton in Dana Point. Planners said riders were confused by the differing routes and recommended a single route making all stops in the future. Some council members suggested dropping a time-consuming stop at The Ranch resort, which takes riders off Coast Highway and back into Aliso Canyon, and directed city staff to come up with alternate solutions. “For what it takes to go in and go out of there I don’t think it’s working,” said Mayor ProTem Kelly Boyd. Staff also asked for approval to research a smart parking lot system and lease program. The smart parking system would use sensors on each parking space to transmit availability to drivers through a mobile app. Initial software and installation could cost $1 million, with annual usage fees totaling $90,000. The city voted to have staff explore the option, which will be brought back to council in the spring or summer of 2018.